Cases dismissed and remanded by the Grand Jury, week of December 31 – No arraignments this week. LOUISVILLE, KY — Today the Jefferson County Grand Jury returned an indictment against Louisville Metro Police Officer Lonzo McConico for the February 2, 2018 assault on 18 year old Tanner Brown following Brown’s arrest outside the Old Louisville Tavern at 1532 South Fourth Street. The Assistant Commonwealth’s Attorneys presenting the case to the Grand Jury provided it with the option of indicting McConico on either felony or misdemeanor assault charges, the difference being whether the injury suffered by Brown amounted to serious physical injury or physical injury. The indictment charges McConico with Assault in the Fourth Degree, a Class A Misdemeanor punishable by up to 12 months in jail and/or a $500 fine. Kentucky Revised Statute 500.080(15) defines “serious physical injury” as “physical injury which creates a substantial risk of death or which causes serious and prolonged disfigurement, prolonged impairment of health, or prolonged loss or impairment of the function of any bodily organ.” By returning an indictment for Assault in the Fourth Degree, the Grand Jury found that the medical evidence presented did not constitute “serious physical injury”. As a misdemeanor, the charge against Officer McConico will be referred to Jefferson District Court for prosecution. The prosecution there will continue to be handled by this office with the Assistant Commonwealth Attorneys who presented the case to the grand jury being appointed to prosecute the case in the District Court. Cases dismissed and remanded by the Grand Jury, week of December 24 – No arraignments this week. “On April 15, 2018, an inmate of Louisville Metro Department of Corrections (LMDC) was assaulted by an officer employed by LMDC. A body cam video clearly shows Officer David Schwartz punching Terry Whitehead who was handcuffed. Once apprised of the situation, Director Mark Bolton terminated the employment of Schwartz and Officer Devan Edwards who observed the assault but apparently did not make the appropriate report. A decision was made, without consulting me or the Office of Commonwealth’s Attorney, to present this matter to the FBI for investigation and potential federal charges to be prosecuted by the United States Attorney’s Office of the Western District of Kentucky. 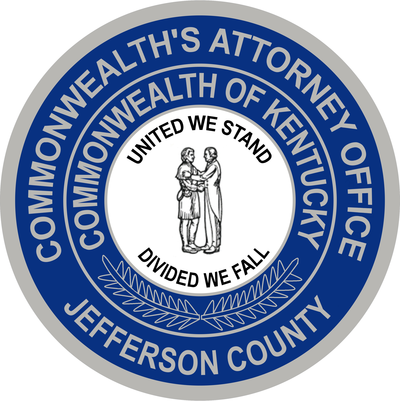 While I am not critical of that decision, it is important to understand that to date, the investigation of this behavior has not been provided to the Jefferson County Office of the Commonwealth’s Attorney for either review or prosecution of violations of Kentucky criminal laws. The public should be aware that the Department of Justice (DOJ) has a labyrinth of procedural rules that slow the process of an investigation such as this one. DOJ rules limit public announcements by the US Attorney as well as the FBI. DOJ should allow some latitude for comment by local federal authorities. The citizens of Jefferson County deserve greater transparency.